Golmaal Again is first and only Bollywood BLOCKBUSTER of the Year! 2017 has been a horrific year for Bollywood films. With October month starting no Bollywood film has reached Blockbuster status. Forget Blockbuster status no Bollywood film in 2017 has touched 140 crore nett in its theatrical run in India. With Ticket price, screen count and even film count increasing every year, this is bit shocking. But it is rejoice for all as Golmaal Again is set to achieve Blockbuster status by the end of second week. Film is on track to cross 180 crore nett at the end of week 2 and will officially be a Blockbuster. Good news is that film is chasing elite 200 crore club now. Realistically if film shows decent to good trending from here on that will be achievable. By our calculation if all goes well film will need less than 20 crore from start of 3rd week onward. There are new Bollywood releases, but still film will get enough screenings to rock even in 3rd and 4th week. We might have the good news of film crossing 200 crore nett inside week four. Great part is if film shows very good trending from here on, then 210-220 crore nett can't be ruled out also. Just imagine all these have happened with clash with Secret Superstar. Because of that Golmaal Again got reduced screening. Had film got solo release it would have easily collected 10-15 crore more in first weekend itself. Honestly film would have been on verge of 200 crore right now and would have challenged for 225 crore mark. Still all is not lost as Golmaal is still going strong at ticket counters. Golmaal Again has every gimmick in its kitty to be a Blockbuster film at box office. This we have mentioned itself in our movie review after watching the film first day first show. We have also mentioned that film is an 'ATTACK' at ticket counters. That statement also come out so true. 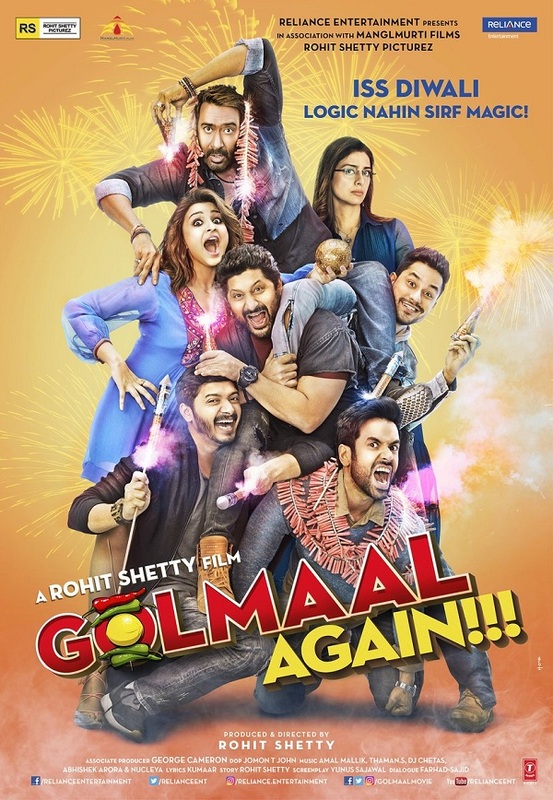 Golmaal Again is thoroughly entertaining and with good content in hand. It is a true example of how commercial mainstream masala potboiler should be made today. Rohit Shetty is king in that department. Big applause for him. Finally it is rejoice for all Ajay Devgn fans. He has bounced big with Golmaal. He is again back to big league in style. Hope he remains more consistent from here on in future. Fans love him and that suggest in openings of the film that got in recent times.